Define eyebrows help you look fuller, more expressive and youthful. 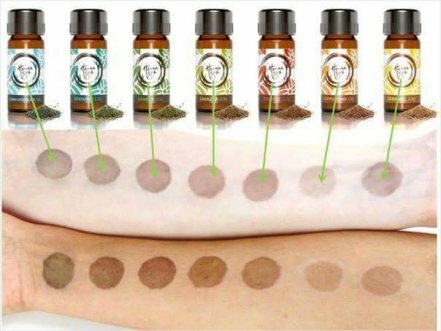 Henna Spa is exclusive formula with natural ingredients that gentry stain your eyebrow hair and give tatoo efect at same time helps eyebrow hair healther. Not contain PPD,lead and ammonia and does not require the use of hydrogen peroxide. Salon offer eyebrow wax for clean brow area to achieve a maximum result.Aqueous Honey wax with suger is low stimulus and Rosin that provide allergic reaction is not blended. Your facial impression will change with eyebrows.Make up artist dfaft the design of your brows to meet your wishes. Mix with natural ingredients that are used as herbal medicine and Ayurveda (traditional system of medicine practiced in India). Henna is well known as stain skin and hair,help them healther.It's used for Ayurveda. Amla is use as harbal medicine in India and for beauty purpose,it is used for enriches hair growth and hair pigmentation. Neem called Miracle Neem as well,thier bark,seeds,fruits and leaves are considerd beneficial effect of natural sterilizing and blended to toothpaste and soap. Eclipta prostrata has black pigment and said that is good for healthy growth of hair in Indonesia and other Asian Countries. ✽Some people provide allergic reaction with natural ingredients.Patch Test is recomended. Form bright to dark brown,7 colours available. Henna Spa stain skin surface and it will fade along with old skin cells peeled off.As a salon care, before apply tint paste, remove old cells of stratum corneum with cleanser and exfoliant gel and clean eyebrow hair.Afre tint, use fixative requid help the color stay longer. Clean brow area with wax and tweezers to emphasize them. Fill in the medical record to confirm your physical condition and discuss about your favorite color and desing. If you have any questions or worry, please do not hesitate to ask. Remove dirt and oil from eyebrow area with cleansing lotion. Scrubing with exfoliant gel gentry to clean dead skin cells. Use cleaning solution and cotton swab to prepare hair. Mix henna powder with mineral solution and let it stand around 10mins. Design your eyebrow with white pencil. Put Henna past inside of white line with brush.Wait about 20 mins and check the stain level.If it is too light or any empty spots, apply again and wait additional time.Any part you need to keep darker like brow tail,incase you need to wait around 1hrs.Remove the past after tint. Removing unwanted hair with wax and tweezers and apply fixative lotion on eyebrows to perpetuate the color of the skin to prolong the effect of tattooing. ✽Lasts on hair for up to four weeks and staining effect on the skin for up to a week or more depending on the condition of the skin and how well the brows are cared for after the treatment. NOT to be accepted if you have following condition. ✽After suntan,Peeling and Laser treatment. ✽Keep eyebrow hair brigher than above sample colors with breaching or dye. ✽Only tweezers can be use if you have allergies with honey,starch syrup and Macrocystis pyrifera(Giant kelp) that contained in wax, Experience of redness and congestion of skin continued around 5 to 6hur when you got wax,Rash with bandaids and physical stress on skin. ✽Idiosyncrasy, history of Kidney disease and Blood disease. ✽If your unwanted hairs around eyebrows are too short, it is difficult to pull them with wax and tweezers. Please let them grow before take this menu. ✽Recently various things can be allergen and reaction can happen to anybody with anything.I consider the safety of materials that use for your skin but there is a possibility of allergenic reaction/contact dermatitis.Also physical condition can be change so incase you may have reaction next time even nothing happen last time with same menu and materials.Patch test is always recomended every time 48 hrs before your actual apprication.Please inquir. ✽There is NONE PPD, Hydrogen peroxide, Lead, Ammonia, Picramic acid sodium, 2-Amino-6-chloro-4-nitrophenol and Rosin included. ✽Skin is easy to sunburn after waxing.Please refrain from bathing beach and taning around a week. ✽After tint and treatment done, if your skin develop rash, itchi, redness and feel unusual or bad, please consult a dermatologist.Incase the symptoms get worse if you rub or use medicine by own decision. ✽I can hardly answer you how tatoo effect last long due to individual diffrentce. The colours that lasts on hair for up to four weeks and skin staining effect on the skin for up to a week.Reffer this tips to keep tatoo effect longer. ✽The day: Avode to wet eyebrow area.You can wash your face, take a sauna, exercise from next day.Take a sauna, vigorous exercise and Bikram Yoga (hot yoga) provide sweat. Get wet can be couse of fade the skin stain. ✽Avode wet: Wipe out type of makeup remover is recomended.Avode make up aroud eyeborws such as eyebrow mascara.Swiming pool,sauna and Bikram Yoga (hot yoga) provide sweat. Get wet can be couse of fade the skin stain. ✽Do not rub: Put form to wash your face and soak up moisture using towel.Do not rub eyebrow when you use skin care products.Avode lie face down. ✽Refrain from the use of oil: Refrain from using oil or cream cleansing.Do not apply face cream on eyebrows. ✽Do not use peeling,scrub and whitening productes:The color stain Stratum corneum.If Stratum corneum's cells are removed, color on skin will fade. ✽Make up: Please use powder eyebrows with soft chip or brush to avode rub eyeybrows if you want to makeup on them.